Hauck Nerf Battle Racer Ride On (Plus, Cheaper Alternative)! Nerf Battle Racer Ride On – Nerf Gun Bike! (Plus, Cheaper Alternative)! Have a Nerf Battle of epic proportions with this crazy Hauck Nerf Battle Racer!!! It can hold up to 4 Nerf Blasters with lots of space for darts/bullets! If this Nerf Battle Racer Ride on is on your kid’s wishlist, it’s back in stock on Amazon (and the price on this Nerf Gun Bike just DROPPED)! Shipping is free! Walmart.com also currently has the Nerf Battle Racer Ride On with Free shipping! Cheaper alternative below! Looking for a cheaper alternative to this popular Nerf Ride-on?! Get a super deal on the Nerf Striker Go Kart Ride On from Amazon or Walmart.com! The reviews are great and it’s a lot less than the Hauck Nerf Battle Racer Ride-On! Get the Nerf Battle Racer Ride-on details below. NERF Battle Racer is the ultimate Go Kart! Get ready to experience the exhilaration of the NERF Battle Racer. Along with the innovative, durable features and sporty design, the NERF Battle Racer gives an authentic driving experience & lets the driver control with Pedal Power! This is a custom NERF Go Kart with placeholders for the NERF blasters, brackets & darts; ergonomic molded seat is adjustable and equipped with a high backrest – for a comfortable and safe sitting position. Speed can be kept in-check with the easy-to-use handbrake. 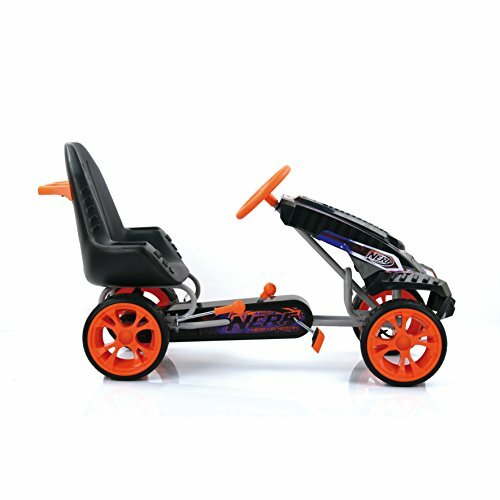 Kids will love the NERF Battle Racer due to its fantastic handling characteristics, child-oriented ergonomics, super awesome sporty design and safety. In addition, it encourages physical activity, builds strength, endurance and co-ordination. Buy the Hauck Nerf Battle Racer Ride On on Amazon. See other Nerf Deals here!As always, Amazon Prices can change quickly. If the price is up, the deal is simply over! Previous articleL.O.L. Surprise! Biggie Pets (Best Price Today!) 5 Choices! !